On first glance, this picture, from 2012, is one of unbearable sweetness, a true Awww moment. 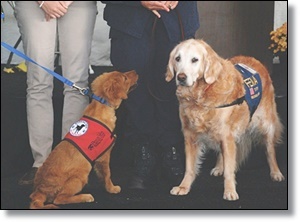 Two Golden Retrievers are standing together, one with a gray muzzle, the other a puppy, both wearing vests signifying that they are working dogs. The older dog is Bretagne, one of the heroes of Ground Zero. Nearly 15 years after the event, she was still making headlines. In August 2015, media carried the story of a happy occasion—her 16th birthday, in which she and her handler Denise Corliss, members of Texas Task Force 1, were feted in New York City. In June 2016, sadder headlines told of her death, just shy of the great old age of 17. The puppy in the picture is also Bretagne, named in honor of the 9/11 sniffing celebrity. She is one small part of the legacy of Bretagne and all the other dogs who helped through those dark days, whether they were searching the ruins or easing unimaginable grief. Young Bretagne, trained to detect blood sugar fluctuations in a diabetic patient, is a graduate of a training school—the Penn Vet Working Dog Center. It is the brainchild of Dr. Cynthia M. Otto, a veterinarian who worked at Ground Zero.